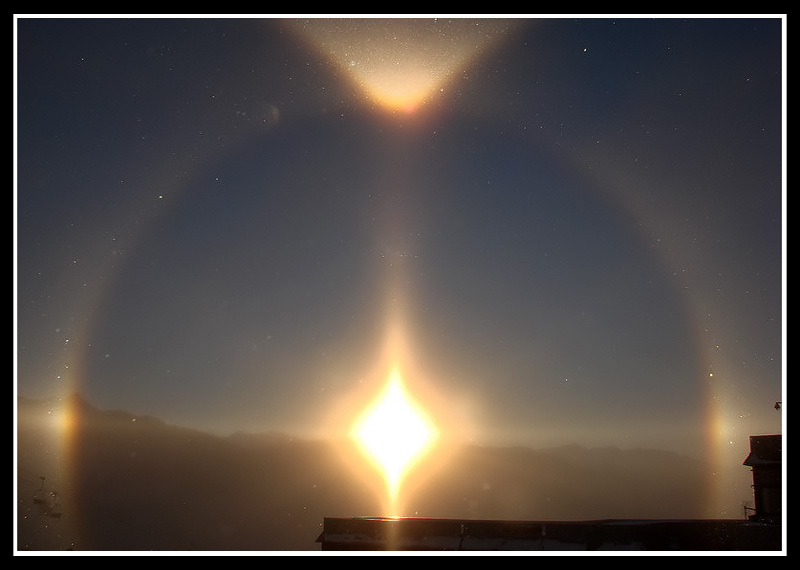 On January 26, 2007, Claudio Martinez watched and photographed a complex diamond dust halo display at the Baqueira Ski Station in the Spanish Pyrenees. Baqueira is situated at an altitude of 1850m. At about 5.30 pm CET the display showed the 22°-halo with sundogs, anextremely bright upper tangent arc, upper and lower sun pillar and the parhelic circle. Part of these was also visible in front of a mountain ridge. In the upper sun pillar there also appeared the Moilanen arc. Nearby floating ice crystals are also visible as bright sparks in the pictures. There is also a video existing. You can see it here. As far as I know, this is the first time that the Moilanen arc is observed in Pyrenees. It seems that a faint heliac arc is visble too on the pictures.